A line will take us hours maybe; Yet if it does not seem a moment's thought, our stitching and unstitching has been naught. 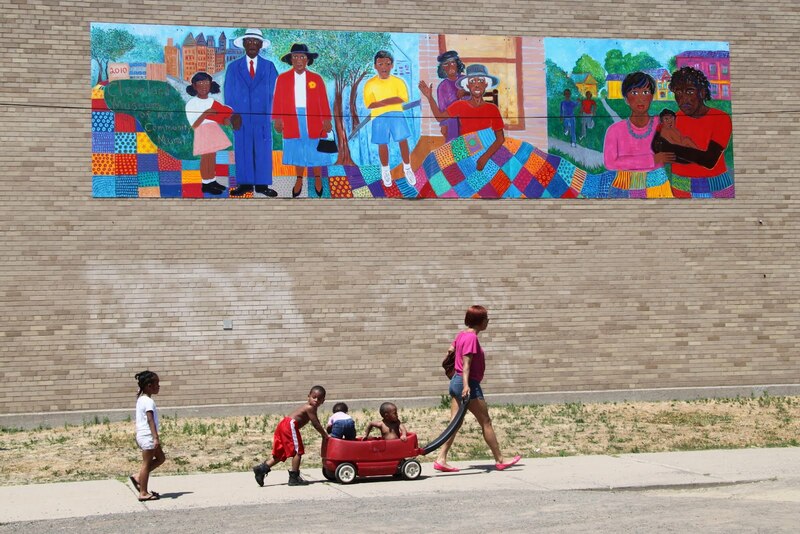 today wall wednesday shines a spotlight on anna arnold's mural 'the storyteller' - the work was created as part of the cleveland museum of art (cma) community mural project. anna's work celebrates the sense of place by metaphorically stitching together the thoughts of the importance of connections and of the importance of past, present and future. the mural is a vibrant and welcoming image which graces the front of the thurgood marshall recreation center located in cleveland's hough neighborhood. i took the photo above on saturday - i can't believe my good fortune to have the group walk in front of the mural right at the time i was present to take a photograph - it may be magical thinking but it was as if the group was a physical manifestation of the mural's message. the second photo is an image of the mural when it was not on a wall but on a walkway! this photo was taken in september 2010, when anna shared the concept and design at the cma chalk festival. 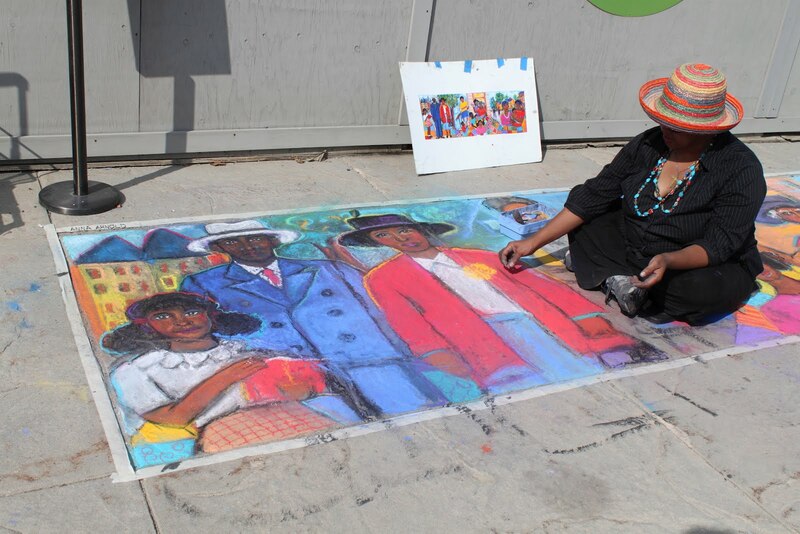 during the chalk festival was a sign on which anna describes and explains the work. A wise old woman is telling the neighborhood children about her past in the neighborhood and her hopes for a peaceful and prosperous future, represented by the young couple cradling the child. In the first part of the mural the old woman is a little girl with her parents and you see the church looming prominently behind her. The church is the foundation in the neighborhood and a place of redemption and hope. The patchwork quilt, representing the wise woman's stories and dreams, is a theme that weaves throughout the work and is a symbol of unity and connection with one's past and heritage. sweet dancer, words by w.b. yeats, music by the waterboys. this song appears on the waterboys 2011 album entitled an appointment with mr. yeats. the album consists of 14 tunes which all are musical arrangements of yeats poems. Love the bright colors in this mural...wonderful photo op. I love that explanation, and the image of "story". You bring it all "alive" mouse! Thank you. It Is Important To Keep Re-Drawing The Past. Wow, that WAS terrific timing in that top photo! It's interesting to see the background on the mural, too. Hi Everyone! I appreciate all of your comments about the mural. Love mouse's vibrant photo. She right, it's magical!